Note: A new rule allows players to put their name in the draft pool and participate in the NBA Combine with the chance they can return to school if they don't like their draft position, essentially testing the waters. This means not every player who applies for Draft entry will actually leave next this offseason. This past season, Duke was extremely talented, with studs like Brandon Ingram, Grayson Allen and underrated Luke Kennard dotting their roster. Unfortunately, depth became too much of an issue for them to overcome, forcing them to bow out in the Sweet 16 to Oregon. In 2016-2017, talent will be everywhere on the court, per typical Duke standards. Ingram is gone, and Allen and more may well follow. 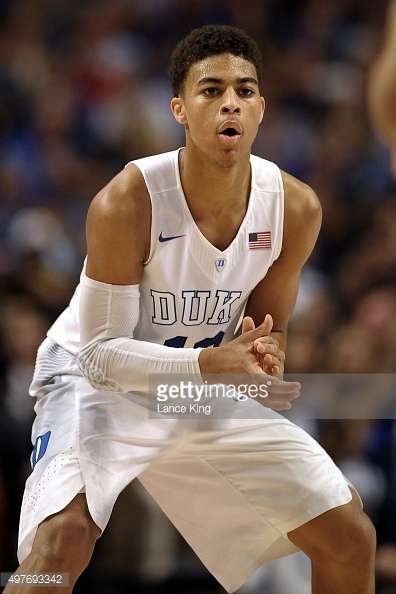 Though, Kennard and steady point guard Derryck Thornton will most likely be back, along with Amile Jefferson, who will most likely receive a medical redshirt after missing most of 2015-2016. However for the Blue Devils it isn't about who's coming back as it is about who is coming in. Harry Giles and Jayson Tatum are the top two players in the Class of 2016, and have superstar potential. Frank Jackson will also arrive and help Thornton at point, as Thornton was Duke's only true point guard a year ago. Another likely offseason makeover for John Calipari and Kentucky, but yet another high ranking. That is just how college basketball is nowadays. Kentucky will lose a number of valuable assets including senior forward Alex Poythress and sharpshooting Jamal Murray at point guard. Though their biggest loss could be Tyler Ulis, who was the nation's best point guard as a sophomore. Ulis remains a strange NBA prospect, and he very well could opt to return to Lexington. If he does, Kentucky may be the best team in the entire nation, because the talent beyond him is special. De'Aaron Fox is one of the Class of 2016's top point guards, and Bam Adebayo and Malik Monk bring plenty of star power. Valuable holdovers like Marcus Lee, Derek Willis and likely Isaiah Briscoe could also help fuel a deep Wildcats' tourney run. After four great years and a fantastic Championship run, Ryan Arcidiacono and Daniel Ochefu's time in Philadelphia has come to a close. Despite that, Jay Wright will once more have something special, headed by the hero of the Championship, Kris Jenkins and company. Jenkins has the chance to be a special player, while Jalen Brunson, a former bigtime recruit will likely take big steps in his sophomore season. Leading scorer Josh Hart is perhaps the nation's most underrated player and five-star big man Omari Spellman could be even better than Ochefu. Losing program cornerstones like Perry Ellis and Wayne Selden, along with likely other valuable reserves would be daunting for any coach. But, for Bill Self it is just another offseason in Lawrence, Kansas. The Jayhawks will obviously miss Ellis and Selden, but their backcourt could be the nation's best next season, with Frank Mason and Devonta' Graham leading the charge. The Jayhawks could lose Cheick Diallo, Brannen Greene and Carlton Bragg, but big man Udoka Azuikbe is going to be very good, and they still have time to reel in one of 2016's greatest prizes, swingman Josh Jackson. North Carolina may be coming off one of the most heartbreaking losses in NCAA Tournament history, and they will goodbye to longtime playmakers Marcus Paige and Brice Johnson. Though, the Tar Heels could still be in play for a Final Four, depending on what becomes of their underclassmen. Forward Justin Jackson will likely test NBA waters, but if he returns he could be a true No. 1 option. Isaiah Hicks, Kennedy Meeks and Nate Britt will also be interesting to watch. If Hicks and Meeks both return, the Tar Heels could still have a very formidable frontcourt. UNC also brings in a strong class, headlined by wonderful guard Seventh Woods. The Ducks proved this past year they could be talked about with the Big Boys and back it up, winning the Pac-12 and reaching the Elite Eight. Oregon could be even better this year, thanks to the likely returns of their big three: Dillon Brooks, Tyler Dorsey and Jordan Bell. Shot-blocking specialist Chris Boucher will also most likely be back and a year later than expected, Villanova transfer Dylan Ennis is healthy and ready to go. While the Pac-12 should be significantly tougher this year, the Ducks are still the clear favorite. If not for Bronson Koenig's miraculous shot at the buzzer to lift Wisconsin to a win, Xavier very well could have been a Elite Eight team and beyond. Chris Mack will have a solid group returning throughout the roster, but will have to wait and see on Trevon Bluiett. Bluiett very well could turn pro, but if he doesn't, the Musketeers may have the Big East's best player. Sophomore Edmund Sumner was terrific as a freshman and should get even better, and Xavier will hope from bigger things from junior J.P. Macura. Also, USC transfer Katin Reinhardt is considering Xavier, and he could add a dynamic scorer on the wing. For the third straight year, Virginia was unable to turn their top-two seed into a Final Four, but they were as close as they possibly could have been. The Cavs will miss Malcolm Brogdon and Anthony Gill, but Tony Bennett is a great coach, and he has really built something at UVA. Point guard London Perrantes will keep the offense humming, while the Cavaliers should expect big things from forward Isaiah Wilkins and Marial Shayok. The addition of Memphis transfer Austin Nichols should help ease the loss of the three big men: Gill, Evan Nolte and Mike Tobey. It seemed nearly half the nation picked MSU to win it all this season and what happened? They fell flat on their face against the C-USA Champions. As sad as it is to see seniors Denzel Valentine, Matt Costello and Bryn Forbes leave on such a depressing note, Tom Izzo should have another great team in East Lansing. Lourawls "Tum Tum" Nairn could run the offense, while former West Virginia transfer Eron Harris showed plenty of promise last season. Deyonta Davis should help ease the loss of Costello, who was a superb rebounder. Izzo did a masterful job on the recruiting trail this year, reeling in three big-time recruits, namely Miles Bridges, an insane athlete who should star from Day One. It should say something about the state of Arizona basketball that the Wildcats won 25 games and finished off strong in the Pac-12 and it was still a down year. It should also say something that the Wildcats will lose three great seniors and are still a National Championship possibility. Alonzo Trier will be back healthy after missing a big chunk of last season. The youthful wing was absolutely terrific last season and should be even better. Kadeem Allen should be also be in store for a big 2016-2017, and Sean Miller reeled in a number of great recruits, most notably Kobi Simmons. The Wildcats are also in the running for Josh Jackson, along with Kansas and MSU. Ignoring the fact they lost 14 games, Syracuse did make a pretty remarkable run to the Final Four this year and will return plenty of talent. Big man Tyler Lydon is going to be a great center, while Malachi Richardson had games where he absolutely took over. Senior Tyler Roberson is a good defender and rebounder and Boeheim develops young talent as good as anyone. This could be a peculiar offseason in Louisville, as NCAA investigation looms over the basketball team. For the time being, the Cards will lean heavily on the services of veterans Mangok Mathiang and Chinanu Onuaku along with guard Quentin Snider. The additions of freshman V.J. King and Penn transfer Tony Hicks should keep Louisville afloat in the brutal ACC. Kevin Ollie has certainly done a great job at UConn but there is no denying his team underachieved last season. The good news is the Huskies could be better, even with the losses of a number of seniors and do-it-all Daniel Hamilton. Amida Brimah continues to take strides as a center and the backcourt is stocked with talent, most notably Jalen Adams and NC State transfer Rodney Purvis. A 15-17 overall and 6-12 conference mark did little to take the pressure off of Steve Alford at UCLA. Once more, Alford responded by reeling in an extremely talented recruiting class, headed by guard Lonzo Ball and forward T.J. Leaf. They will join Alford's son, Bryce, and Isaac Hamilton to form what could be a very sneaky Bruins team. If you want a dark horse look no further then Blacksburg, Virginia, where Buzz Williams has a legitimate contender in just his third year at the school. The Hokies ended last season on fire and return every single major contributor. That includes underrated Zach LeDay and Maryland transfer Seth Allen, who should lead the show.